is the most family friendly apartment of 5 accommodations. Its located on the ground floor of the 3BR/2BA “Casa Acacia” farmhouse - also a rental unit - which is a combination of 'Tana' and the loft apartment 'Bellavista' . The house is slightly set apart , therefore guarantees privacy. 'La Tana' can be reached going down a paved walkway. The entrance is up 4 steps from the sun terrace ( pool area view ). The apartment has 2 cosy double rooms sleeping a max of 4, 1 shower/WC as well as lovely rose-covered winter garden-style sitting room. Its a fantastic apartment with lots of charm and its own more then 350 years of history . Enjoy the sunset in complete silence from your terrace, garden furniture, sunbeds as well as a bbq. Gaze onto onto the extended gardens, the romantic creek and the surrounding maddows and vast macchia covered hills of this private property of more then 76 ha. Start your hiking and biking directly form your doorsteps on well marked trails. Or simply take a stroll on our meditation trail along the small creek with its waterfalls, walk up to the waterlily pond or through the valley to the nearby town of Castellina in Chianti. Or take a dip in the large community swimming pool that you share with very few other guests (5,5x11x1,50m and 2x3m splashpool entrance platform for the smallest, ). During the cooler season you may use my private pool house - unheated water. The extended leisure areas and wellcared gardens of more then 2 ha , equipped with garden furniture, the childrens playground with soccer field, ping-pong table, sandbox with fairhouse and swing, .are the pride of the German owner and her staff. Cascades of flowers, rose bushes, citrus fruits as well as the surrounding meadows with many rare types of orchids and wild herbs create the unforgettable image of a lost paradise.. Animated is this small paradise by various cats, 2 freeroaming wellbehaved dogs (1 male, 1 lively female), a pictoresque small herd of cameroon sheep, chicken, geese, ducks, pigeons and more. Stunning the variaty of birds and butterflies as well as fireflies. And with a bit of patience one may also see wild boars, deer and roe deer, foxes, badgers and porcupines as well as the rare Tuscan eagle that breeds in our valley. The housing complex is surrounded by grass, gravel - as well as terracotta paved walks and stairs which join the different levels with their romantic porches and apartments. Several natural quarry stone terraces with solitary trees like cypresses, acacia, pine and oak trees are leading to the small creek where the real wild nature begins. Admire the increditable variaty if wild flowers and walk along small trails that we cut right through the maddows - amazing the spectacle of fireflies in late May and June, the rare songs of the our numerous nightingales and the concert of hundreds of birds in the morning and evening. Because of its privacy and our efforts this is still a rare paradise - and only minutes from the next town center !!! When planing your trip take in consideration that due to our perfect location, most important sights can be easily reached within 1 hours drive. Also please dont forget to leave some space for one of the many concerts, horseback riding or some evening with newfound friends or maybe a halfday cookery course with local dishes. Extremes like biking on the new trail up at the Apennin mountains or island hoping on the Tuscan coast are also possible. Enjoy a dream vacation in Tuscany's heart - the 'Chianti Classico' region - only few miles from Florence and Siena, easy to reach from Pisa and Florence airport - surrounded by the the world-famous landscape of extended vineyards, silvery olive groves, vast forests, colorful macchia and solitary estates. Was infected with the 'Tusan virus' after my first visit (like so many others) some 30 years ago and after various vacations decided to finally settle in the heart of Tuscany - the Chianti Classico' area. Here I found everything I ever longed for - nature, peace, clean air, good food and fantastic wines and culture of the highest level. After some years I decided to share my experiences (also cooking) with guest from all over the world and opened a rental activity. finish sauna - cool season only - extra charge €15/pers. 5,5x11m, 1,20 - 1,60m, very large leisure area and wellcared gardens with garden furniture - few selected guests - no crowds!!!! Poderi Val Verde - an authentic farm estate from the 16th century – located only 2 km from the wine town of Castellina in Chianti and within 1 hours drive to most famous sights of Tuscany is a real “living” farm – with farm and court yard animals , free roaming dogs and cats - in a surrounding and live style of “once up the time” . Its a place for the individual travellers, looking for something different – for the feeling of solitute, peace and untouched nature. For people that like good original food (on-site dinners and cookery classes) and good wines. For people that like to explore the country side by bike or by foot and next to visiting the countless cultural sights will also find time to attend one of the many cultural events such as opera, concerts, etc. For people that include in the plans a visit to the many Thermal springs and spas as well as the beaches and marble caves of the Versiglia. For people that enjoy travelling in the colder months when Tuscany seems to hibernate into the past. When in restaurants you find only locals and tourists are greeted with a welcoming smile , museums and other cultural places are empty and the Chianti belongs to only you. When the air is heavy with the smell of the many fire places, the new young wine , the freshly pressed olive oil, grilled game meat and the famous bistecca . Poderi Val Verde (Farmhouses in the green valley) was restored in 1998 and retouched in 2012. It was left itentially rustic – original fire plces, cotto floors, beams, roofs and many little architectural particularities that mark centuries of living in this place. We are fully aware that with this we are going against the usual main stream of modern design. When you step into our accommodations – you seem to step back into the past – rooms , setting and furnishing are according to the “Arte Povera” – as it used to be – as you saw it in films such as “under the Tuscan sun” or in “Romeo and Juliette” - but functional as in any modern house. 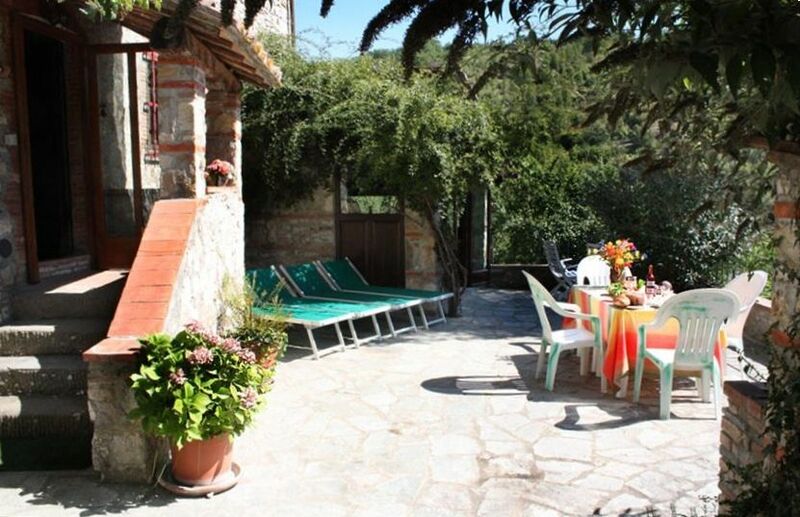 Shady rose-covered loggias and sunny terraces with nices views are part of this all. As most really old farm houses it was built in a large, open, sun-filled valley, thus protected from cold north winds and wet fogs, ventilated by warm south winds in the afternoon, with pleasant cool night temperatures due to the surrounding macchia and woods and with unlimited supplies of fresh well water. The famous ancient “mules trail” passed through here – mules transported salt from the salt mines of sicily to the north – trails that always followed the course of water and wells and developed into important traffic venes. Prove of this are the many monastries and cloisters and farm houses that you find along this old road, which i salso part of our trekking “network”. Surrounded by more then 2ha of wellcared parklike garden – unlike any other you might find - sits the imposing guest house complex which is dived in 3 apartments (2-4 Pers.) , and/or 2 semiattached houses 'Casa Pineta (8-13 pers.) + 'Casa Acacia (6-8 pers.) as well as the lovely small villetta 'Casa Capannina ' (4- 6 pers.). The community pool of 5,5x11 m with extended leisure areas and surrounding gardens as well as sports facilities is open as of mid may . During the cooler months you may use the a small covered (not heated) pool of the property owner, the only of its kind in the area. weekly change of bed, bath and table linen, pool towels, bathrobes (on request) fire/barbecue wood, use of washing machine, dryer, iron and ironing board, as well as a starter package of spices, coffee, black or green tea, toilet paper, creme soap and detergent .